Photo by: T.J. Watt (AFA – B.C.) – Vancouver Island, B.C. Since 1966 and the adoption of the Common School Construction Fund to build schools for baby boomers, the DNR has maximized revenue for schools by allowing private logging companies to aggressively clear-cut our leased public lands. The resultant devastation to fisheries and forests is well known. 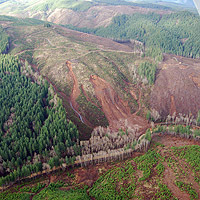 In the 1980s, logging caused landslides in the North Fork of the Stillaguamish River watershed, including the infamous DeForest Creek/Deer Creek slide that almost eliminated the Stillaguamish’s legendary run of acrobatic summer steelhead and discharged an immense stain of mud for almost three years into Port Susan Bay, 37 miles downstream in Puget Sound. Just across Deer Creek from the DeForest slide area lies the Whitman Bench and on the far side of this bench lies the North Fork Stillaguamish proper. In 2014, the Oso Slide was caused by a variety of factors. Although DNR forest practices and policies did not cause the slide, most experts and laymen believe DNR decisionmaking, practices, and polices contributed to the conditions that helped make it possible to happen. In addition to the unstable soil regime, and incessant rain that winter/spring, the slide zone’s hydrological profile was destabilized by DNR authorized clear cuts on private land just above the perimeter of the slide area. Further, according to the Washington Forest Legal Center, 78% of the forestland on the Whitman Bench above the slide area at Steelhead Haven was DNR land (predominately school trust lands). This still heavily logged area destabilized the areas hydrological profile even further. Also, of course, the DNR authorized the Grandee Creek logging company to make the final, fateful “piece of pizza” shape cut near the lip of the slide zone, which caused some hydrologists to speculate that the excess water funneled down into the lside zone, further destablizing an already unstable situation. “Little Mill Creek, filled with mud and debris, turned dark like chocolate syrup. “But in Little Mill Creek and elsewhere in the Upper Chehalis basin, a Seattle Times investigation found that Weyerhaeuser frequently clear-cut on unstable slopes, with scant oversight from the state geologists who are supposed to help watchdog the timber industry. The December storm triggered more than 730 landslides in the Upper Chehalis basin, according to a state aerial survey. Those slides dumped mud and debris into swollen rivers, helping fuel the floods that slammed houses, barns and farm fields downstream. Read a longer article on the Chehalis Disaster.